Originally, I was going to do something a little different with today’s review. Last week, I took a look at Masterpiece Sideswipe and so I’ve basically already covered this entire figure. Just take out the word red, toss in yellow and *boom* it’s pretty much done, aside from a few cosmetic changes. The plan was to do just a quick Review Gallery for Tigertrack, highlight some of the differences, and mark him as done. But in photographing Tigertrack, I realized that I had a story I wanted to tell. It’s about loving & collecting toys – actual toys, not just little totems from my favorite licenses. So, if you need to know the specs of Tigertrack the toy, head back to Sideswipe’s review because you’ll find most of what you need to know there. There are a few differences other than deco changes, namely the jackhammer accessories instead of the piledrivers and the neat idea to swap in Red Alert’s faceplate with Sideswipe’s head. It gives Tigertrack a slightly unique feel – it’s not a lot, but on redecos every little bit counts. Other than the yellow overall deco, there’s some nice little touches like the blue tampos on the feet and the two-tone missile “launcher”. Finally, the packaging is unique to Tigertrack, featuring a simple, but elegant silver foil design. Pretty neat. Okay, if you need more than that, go check on Sideswipe, because we’re about to go neck-deep in the history of Tigertrack! I don’t mean to come across condescending earlier when I mentioned collecting toys versus totems. There’s nothing wrong with collecting toys based on everything but the toys themselves. I do it all the time myself. Is my DC Classics shelf full of amazing action figures representing my favorite comic characters of all-time? Not really. It is loaded with some of my favorite comic characters of all-time (I still am in awe they made Jemm, Son of Saturn), but the figures mostly range from great to good/average, with a few real stinkers in the mix. I don’t mind one bit, because I love the little plastic universe hanging out on my shelves. Now, I do much prefer it when a great toy matches up with a property I love – that’s how Takara has got me buying these Masterpiece dealies to start with. In trying to decide where to draw the line, just looping it around the G1 characters of my youth seemed a really smart place. And by that standard, I didn’t much need a Tigertrack. He’s not technically a G1 character, instead paying homage to a redeco of Sideswipe available through Figure Oh magazine in Japan. That was available just ten years ago. In toy years, that means the Hulk movie figures were out, MO2K was still (sorta) in stores, Transformers was somewhere between Armada & Energon. DC toys were, as usual, barely at retail with the 6” Batman line dying & JLU getting its slow start. So, basically, not that long ago and a lifetime ago at the same time. I also took a pic of the rear before I got out of my car, but I don’t seem to have uploaded it? 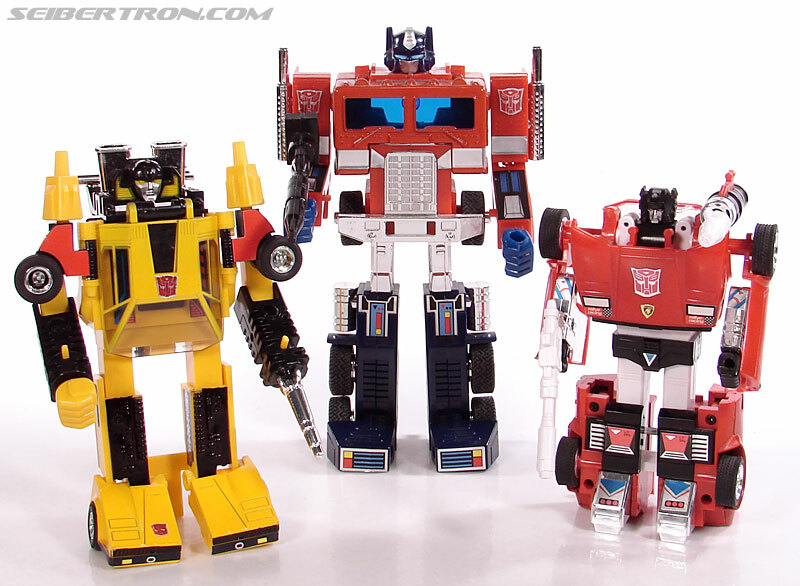 Also, didn’t the G1 Sunstreaker have a slightly different robot mode? different head, chest was rotated 180, and the engine kibble (intake?) was more prominent on his back? then Prowl and Silverstreak were some type of sedan, not Lamborghinis like the twins. Prowl, Bluestreak, & Smokescreen were all based on the Datsun Fairlady Z (which will be the next rash of Masterpiece figures). Thanks for clarifying — I wasn’t sure if this was “supposed” to be Sunstreaker — but it’s not! I should have known, SS has a completely different head! Love the Tiger joke in the extra pictures. Also, that the red guy is racist. Oh yes, Tigertrack, you would look most excellent in stripes! I wonder how many collectors who aren’t up to snuff on their Diaclone history will confuse Tigertrack with Sunstreaker? It’s kinda easy to do if you don’t keep a sharp eye out. Having the sticker application be optional was a classy move on Takara’s part. Tigertrack’s non-alignment would make him a great fit for the current storyline in IDW’s Robots In Disguise series. I think some folks might have gone so far as to pick up TT in lieu of Sunstreaker. The body is wrong, but a few 3P parts and he’s an easy substitute if Takara never gets there. Yeah, there were a ton of people that were very adamant. “You mean Sunstreaker.” “This repaint is Sunstreaker.” “Who is Tigertrack? It’s Sunstreaker, guys.” My favorite was, “What a stupid repaint. Sunstreaker doesn’t even transform in the same way as Sideswipe. I can’t believe they did that to him just so they could reuse the mold!” I mean, I get it. The alt-modes are pretty similar. I just think it’s funny that so many people were so quick to hate on Takara when they were using the wrong information. Excellent review, pics, and comics. TT looks pretty damn good, but I’ve got to save my money for October’s MOTUC inundation. Even had to cancel my MP Bluestreak pre-order (the only Fairlady variant I wanted) because of October. I’d like a Bluestreak, but I want a bunch of Horde Troopers a whole lot more. Lots of MOTU coming at the end of the year, yeah! Sheesh! That Swerve has little in common with the more hilarious Swerve in the IDW comics, but it’s an interesting read regardless. I was really mad about him back when I was collecting Alternators. I saw one for $25 or so a few weeks ago and I’m almost bought it even though I sold all but one alternators since then. Just as an example of cost differences. Tigertrack was the version of this mold I paid the least to get. Also great review, uh story, uh I don’t know what you call this. I need MP Tracks NOW! Of course now they are doing a second run of Sideswipe, so me being me put in the preorder, same with the G2 Black one. I have a problem. I also really like this mold. Can’t wait to see what they do with the new cars. It wasn’t cheap going back and grabbing Grimlock & Rodimus (though I kinda regret Rodimus (which is sad because he’s my fave). Starscream just needs to get reissued.